Eggplant or aubergine? I have been writing my recipes for so long now for my American audience, I am starting to forget which terms I used at home. Whichever name you call this vegetable, it is pretty versatile because it absorbs flavours easily. Buy when in it’s season and cheap. And at only 6g total carbs (3g net) per 100g, it’s a nice change for a snack. 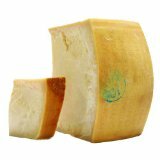 In addition, the melted cheese, herbs and parmesan create a crunchy texture too. Some readers find when they cook eggplant it goes too soft or soggy. I cook it until it has a very slight crunch in the middle. When the eggplant slices go back in the oven with the topping, that last little blast of heat is just enough to cook the eggplant all the way through, but without the risk of becoming too soft. 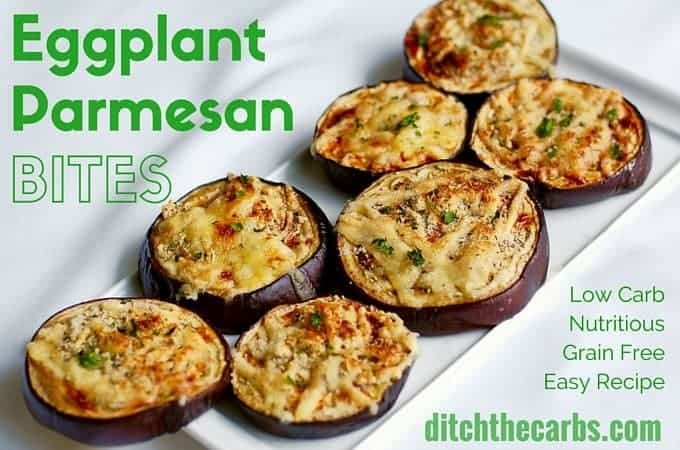 Low-carb eggplant parmesan bites are perfect as a snack, appetiser or even a full meal depending on how many you choose to serve. Choose your favourite cheese to top them. Place the sliced eggplants on an oiled baking tray, sprinkle each slice with salt and pepper. Grill (medium) or bake 180C/350F until browned. While the eggplants are baking, mix all the herb and cheese crust ingredients in a small bowl. Remove from the oven and turn each slice over and sprinkle with more salt and pepper. Grill until just turning browned and cooked. I like my eggplant to be slightly firm as they can easily turn incredibly soft if cooked for too long and more difficult to hold. Brush the top of each eggplant slice with the beaten egg. Sprinkle with the herb and cheese crust then place back in the oven/grill until the cheese is just melted and beginning to brown. Serve with sour cream, salted yoghurt or garlic mayonnaise as a side sauce. Would these keep well for a car trip? Or are they better served warm from the oven? I have only eaten these warm from the oven, but they could work as a cold snack, come back and let us know if you tried. Safe travels! This was lovely. I used Italian Herb mix instead and a small pinch of French herbs just to experiment. So cheesey, so tasty. Didn’t use any sauce to eat with them with rather I fried some Australian Pork hicory smoked bacon, then mixed my homemade tomato chilli chutney into the bacon. The smoky bacon with the grilled cheese flavour on the eggplant was perfect. Great way to use eggplant. Thankyou Libby! This was good, because of the toppings. The eggplant slices were very dry and tough, except for a few that were thicker, even though none of them browned. It would be helpful if you included how thick to slice the eggplant and how long to bake. I noticed that in several instances when looking at the nutrition label information for a recipe, it gives the carbohydrates etc. per serving but does not indicate what a serving is. For instance these egg plant bites. How many equal a serving for that amount of carbs? Or approximately? Ditto for the zucchini recipe. I think they’re called zucchini fritters or something like that. What is the serving? One, two, or four ounces, or what? 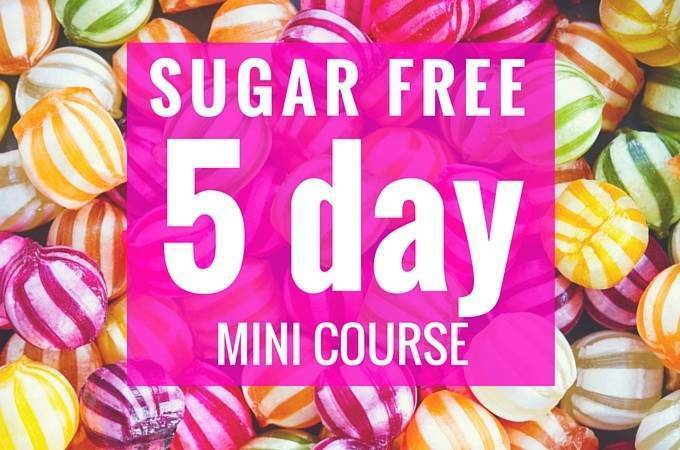 That information is very important for low-carb people especially diabetics. 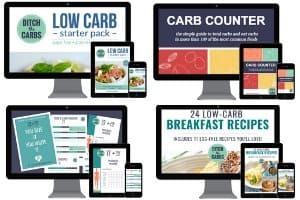 I am diabetic and I need to know how many or how much weight wise equals that amount of carbs especially since I need to eat very low-carb. Great question – for all my recipes, they state how many servings it will produce. 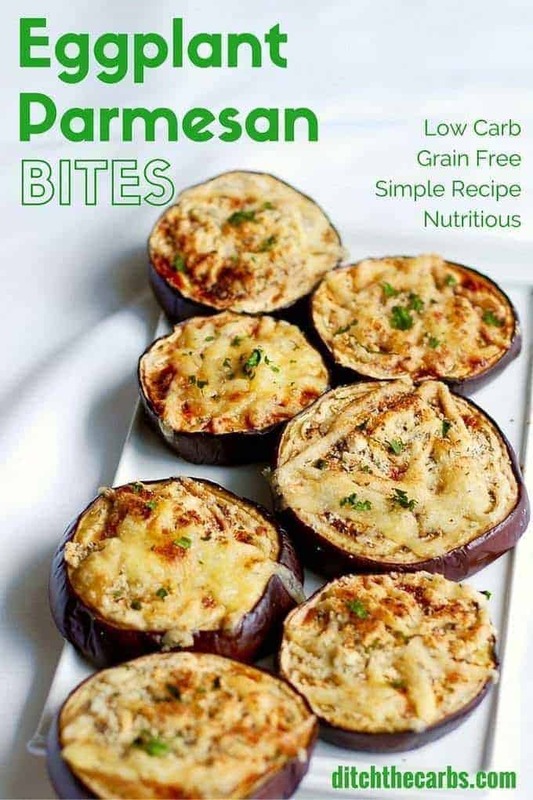 For example these low-carb eggplant parmesan bites shows that it “serves 10”, so a serving is 1/10th of the entire recipe. I can’t say how many slices because everyone will cut things smaller or bigger and eggplants will vary in size. You can also dial up how many servings you would like to make, the nutrition per serving remains the same. do the eggplant slices have to be salted first to get the excess out or not necessary with this recipe. I just made these. Or a version thereof anyway!! I mixed a spoonful of basil pesto in with the cheeses & almond meal and topped with bits of sundried tomato. Yum!!!! I don’t care for eggplant but had a bunch of zucchini that needed to be used. SO good! Love most of your recipes, but I felt there should only be 1/8 cup pecan flour and perhaps some butter melted to bind it more. Love the eggplant. How many bites equal a serving? These worked out great for a potluck I went to last week, I made the lemon and rosemary–used the long Chinese eggplant sliced for more but-sized portions. Awesome for vegetarian & gluten free! That should say “bite-sized”!! Damn smartphone! Smart phone should be an oxymoron!